Encaustic Art by Valerie Long. 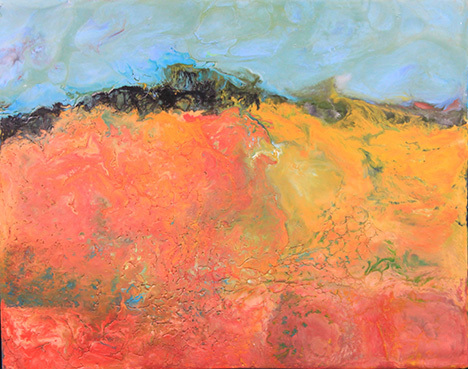 ​The Epsom Public Library is pleased to present“Abstraction,”an exhibit of encaustic art created by Valerie Long. Valerie is an abstract artist who uses encaustic wax as her medium; she is also a juried member of the Historical Society of Early American Decoration (HSEAD). Encaustic art uses a variety of materials and methods, achieving an image with amazing movement and texture. One of its most alluring attributes is an exquisite surface quality. A major contributor to that quality is beeswax, which is impervious to moisture and will not deteriorate, yellow or darken. Capturing the true depth and luminosity of encaustic wax takes experience, knowledge and skill. The outcome is a unique and original piece that stands the test of time. Inspiration for art, any art, can be derived from cultural tradition, spiritual expression, recorded history, and the use of visual rather than verbal language. Concurrently, “Small Objects: Forms Inspired by the Natural World,” an exhibit of non-functional pottery by well-known Barnstead potter, Teresa Taylor of Salty Dog Pottery, will be featured in the library display cases. Teresa is a member of the League of NH Craftsmen, the Potter’s Guild and a participating Artist-in-Education through the NH State Council on the Arts. She also serves as President for the North Country Studio Workshops. Her work has been exhibited in galleries and shows throughout New Hampshire and the Northeast. These two dynamic exhibits will run through June 9 and may be viewed during library hours: Monday-Thursday, 10 am to 7 pm, and Saturday, 9 am to 1 pm. All are welcome to an opening reception on Friday, April 27, from 6:30 to 8:30 pm. The exhibit reception will be held at the Epsom Library on April 27th from 6:30-8:30 pm.